You know my heart. For better, or for worse, I’ve prayed that you’d give me your heart for people. Well, Lord, my heart is shattered. Feels crushed sometimes. As the God who has arms big and strong enough that hold the entire universe, I believe you understand my heartbreak – perhaps better than I do myself. Our nation needs more hope. I come to you on behalf of my friends John and Joe – whom I know that you know well, and I ask for your governing protection. This weekend will be the beginning of a new era in Birmingham. 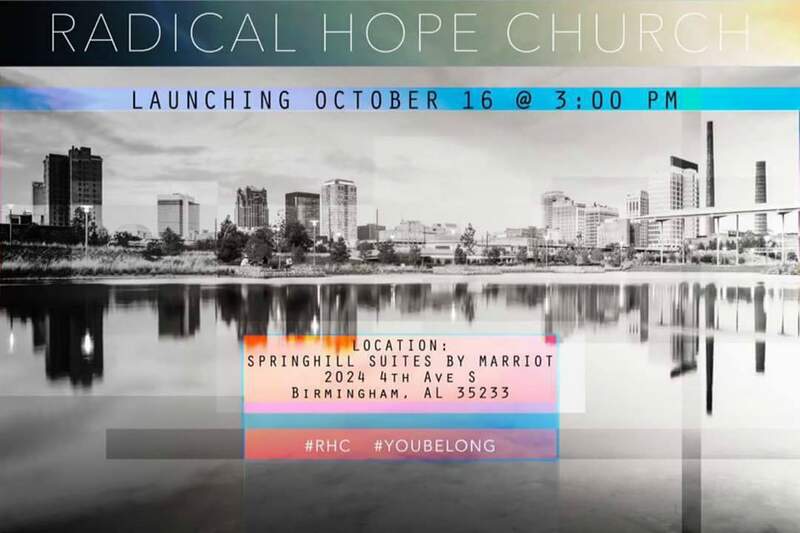 This weekend, I pray your hand lead and guide them as Radical Hope launches. Radical Hope. God, I know that is inspired directly by your heart. I pray that hope, radical hope, spreads like wildfire – through your church, through their city, and that (through you) they have a footprint on our world, one unable to be ignored. May those who are hurting, hungry,and today thirsty come to know you through this place. May they share messy grace and radical hope with all your children. May all human beings walking through their doors be able to connect with your love. May they know they are loved exactly where they are – no strings attached. Gay or straight, pink or blue, God I know you’ll love them as the beautiful human beings they are. May they feel accepted and especially loved for who they are, where they are, and whomever they’re with. My prayer is that the churched and unchurched alike can come together and be. Just be. May the stereotypical view of Christians and the church be shattered as people find hope here. Lord, may your will be done. May humanity be touched by the willingness of this new body to speak and share your heart with a broken world. God, be with them this weekend as this new era of radical hope, messy grace and unconditional love is ushered into this city and beyond. Thank you for this and everything I’ve forgotten. I love you.